PUPILS at one of South Tyneside's oldest schools have waved farewell forever. St Mary's C of E Primary School in South Shields closed its doors for the final time today after 141 years serving the Tyne Dock community. As part of a 1m Government improvement scheme, St Mary's is to merge with All Saints Primary School in September under the new name Holy Trinity C of E Primary. The new school will be on the All Saints site in Brockley Avenue, using current buildings, with a refurbishment also taking place. Headteacher Karen Pemberton was drafted in two years ago when the Whitehead Street school went into special measures. 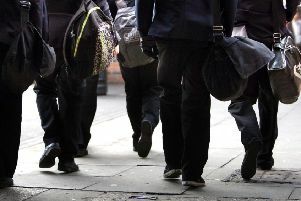 Mrs Pemberton, who will be working for the Local Authority from September, not only managed to get the school out of the measures, but Ofsted said the school was 'satisfactory with good features'. The school certainly went out on a high. Mrs Pemberton said: "Our time at St Mary's has been a blessed one, and we are pleased to go out on a high with the best (although as yet unconfirmed) SATs results in the school's history. "Thanks to everyone who has contributed to making this a super final year." The school celebrated its final days with events, including a 'memories of St Mary's' art exhibition, a performance of Joseph and the Amazing Technicolor Dreamcoat, a leavers' assembly, street party, an open day with a chance to look at old photographs and log books, sports afternoon, a final Eucharist service and a magic and variety show. parents, carers and friends, and the children have had a lovely time celebrating, reliving memories and receiving gifts and souvenirs which we hope they will treasure. "The future of all staff is now settled, with some moving on to other schools, some into further training for new careers in teaching and others taking retirement. "This has been a sad time for everybody, including our chairman of governors Jackie Murray, who has now stood down on the governing body."